Is There Money In the Can? Picture yourself walking around outside of an event... Have you ever asked yourself, "Is there a way to make money with those Port-O-Johns?" Highly doubtful. Well, there's money to be made out there. Have you ever considered pitching a toilet paper company? 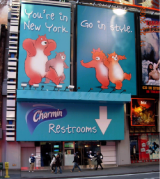 When it comes to marketing the "bathroom experience", Charmin stands head and shoulders above the rest.